Under normal circumstances, business leaders meeting with America’s future President would just be business as usual. 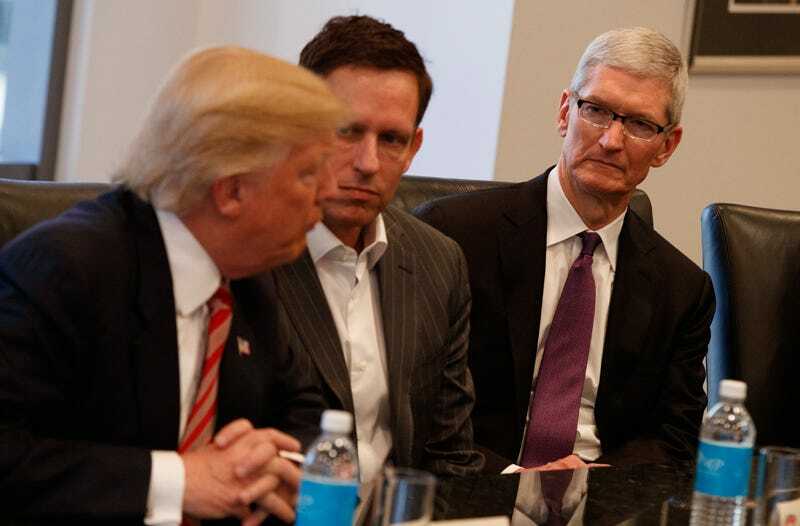 When those leaders represent the liberal stronghold of Silicon Valley and that future President is Donald Trump, however, it’s anything but. So after Tim Cook and other top tech executives met with the President-elect last week, the Apple CEO explained his (visibly uncomfortable) attendance to employees on Monday, basically saying it’s better to have a seat at the table than stand screaming in the hall. Governments can affect our ability to do what we do. They can affect it in positive ways and they can affect in not so positive ways. What we do is focus on the policies. Some of our key areas of focus are on privacy and security, education. They’re on advocating for human rights for everyone, and expanding the definition of human rights. They’re on the environment and really combating climate change, something we do by running our business on 100 percent renewable energy. Of course, when it comes to key issues like immigration, it’s hard to imagine how “a debate of ideas” could influence the President-elect. And as admirable as Cook’s commitment to open dialogue might be, Trump’s victory itself makes a solid case for just yelling.